Can you feel the excitement because I sure can. It literally has me shaking all over and giving me goosebumps which has my skin feeling like sand paper and you ask me why, well you should already know why. It is finally the start of the World Series of Poker Main Event final table and if I feel this much excitement and I’m not even playing in the tournament, then I wonder how each of the final table participantsare feeling, one could only wonder. Well I do have a little bit of bad news, the date is only November 8th so we still have to wait another 24-hours and then we will have the most exciting sport in this generation pick right back up where it left off at back on July 15th. All of the final table participants are in Las Vegas right now and everyone of them is getting ready for the biggest poker game of their lives. Its easy for me to say its the biggest of their lives because not one of those players has ever played for the amount of money that will be rewarded to the winner of the World Series of Poker Main Event final table. The stage is already set up, the cameras are in place. The only thing missing are the players. The players that are making the return are the chip leader Dennis Phillips who is a 53 year old amateur who works for a trucking company in Missouri. The mad Russian Ivan Demidov who has had the most success since the main event was delayed back in July. There is also the most experienced player in the entire group and that is David “Chino” Rheem whom most people say will win the tournament because of his experience at the poker table. You also have a couple of Canadians who are at the table and they are Darus Suharto who says that he can not even beat his home game and then there is Scott Montgomery who in some peoples eyes should not be here because of some very questionable plays which he got extremely lucky with. Please also welcome the chess master Ylon Schwartz from New York who is considered to be the most patient at the final table. There are then a couple of players that have the opportunity to beat Phil Hellmuth’s record as the youngest player to ever win the main event. Those players are 23 year old Craig Marquis and 22 year old Peter Eastgate. You then have to say hello to the short stack out of the bunch and his name is Kelly Kim who only has just over $2 million in chips and of course just because of that he is considered the long shot. But hey you never know what can happen and hey I’m rooting for Kelly. “GO KELLY”. The final table will start play on November 9th at 10 a.m. inside the Penn & Teller theatre which is located inside of the Rio Hotel & Casino. 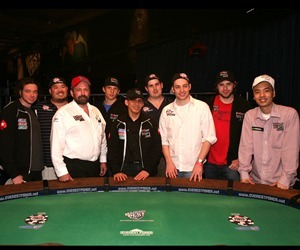 Once the table is down to its last two remaining players, the game will once again be stopped until the night of November 10th at 10 p.m. Then it is time for the rest of the world to see how will become the 2008 World Series of Poker Main Event Champion when ESPN will air the entire final table (edited of course) starting at 8 p.m. ET. It is going to be an exciting game of poker that everyone should enjoy. So everyone get your popcorn ready it is now time to award that most skilled player with the $9.1 million dollar prize. Good Luck to all participants of the World Series of Poker Main Event Final Table.